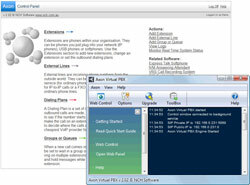 cloud PBX is a virtual IP PBX for Windows designed to manage phone calls in a business or call center environment. Easy-to-manage IP PBX is designed to bring enterprise-grade features to large-and-medium sized businesses. Its web-based administration makes phone system management easy. Since an IP PABX is software-based, it is easier to develop and add additional feature sets and modules.